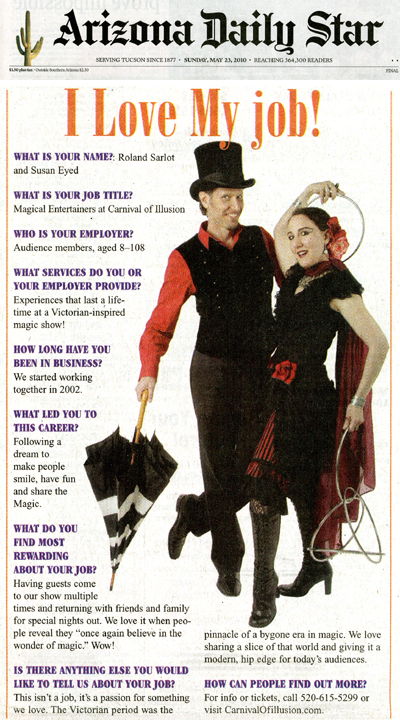 January 2011 Arizona Daily Star-I Love My Job! "This is a wonderful Arizona institution. I'm a huge fan!" "...conjures up the kind of mystery that brings an audience together in awe." "Susan Eyed and Roland Sarlot are masters of the craft." "As breathtaking as the illusions were, the show was bigger, somehow more extraordinary, than the individual, mind-boggling tricks." "Amazing magic and personal magnetism create a wonderful experience." "...quaint, funny, vaudevillian, charming, energetic, and at the same time amazingly sophisticated and highly professional." "They have put together a great show and you owe it to yourself to experience their boutique, small audience space." "You're in for an excellent experience. They are truly artists of their craft." Members of the press are invited to download high-res images and videos. Please contact us at (520) 615-5299 or thrills@carnivalofillusion.com for a passcode. If you would like to receive our press releases and latest news, please contact us at (520) 615-5299 or thrills@carnivalofillusion.com. Contact (480) 359-SHOW or thrills@carnivalofillusion.com. For deadlines call us 24/7 at (480) 359-SHOW office or (520) 404-9808 cell.